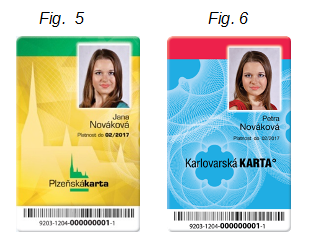 Passengers not having a "Marianka" card or a contactless bank card can pay for a ticket in prepared cash directly at the driver´s - after paying withdraw the printed ticket at the bottom of the passenger terminal. You can purchase a single ticket or a transfer ticket, or a 24 hours valid ticket. Passengers having a contactless bank card VISA or MasterCard or a transport card "Marianka" with sufficient electronic cash on it, will select the appropriate ticket on the touch-pad (Fig. 1), attach the card to the designated place and take the printed ticket under the display at the bottom of the terminal. If the passenger needs more tickets (e.g. for the next passenger, luggage, etc. ), he has to repeat the above procedure. If the passenger does not have sufficient cash on the card, he (she) will hear a beep and the display will show this information (Fig. 2).